Epilepsy Research UK > Get involved! 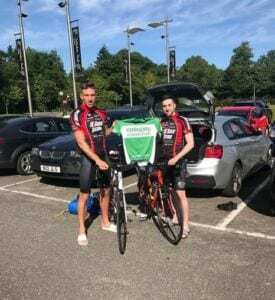 > Focus on fundraisers > Barnsley Footballer completes the London to Paris Cycle! 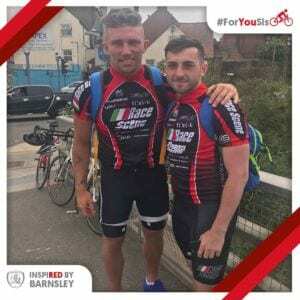 Barnsley Footballer completes the London to Paris Cycle! 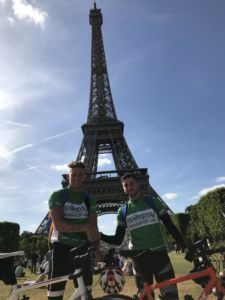 Angus MacDonald completed the London to Paris Cycle ride in June with his friend Tom Anderson, to raise much needed funds for Epilepsy Research UK. Angus’s sister has epilepsy and this is the 2nd time Angus has taken part in a charity event for us – what a fantastic achievement on completing the challenge and huge congratulations to them both! In the build up to the event Angus was busy fundraising and arranged a collection day at Barnsley FC; he also auctioned the boots that he was wearing when he scored a last minute equaliser against Sheffield Wednesday last season to one lucky fan! We are so grateful for all the support that Angus has shown for Epilepsy Research UK and look forward to updating you with the totals raised. Thank you so much again Angus for such committed support of our work – here are a couple of photos from the event.